LONDON--(BUSINESS WIRE)--The global tiny homes market is expected to grow at a CAGR of approximately 7% during the period 2018-2022, according to the latest market research report by Technavio. A key factor driving the market’s growth is the cost-intensive construction of conventional houses. The demand for tiny homes is mainly driven by the high cost of conventional site-built homes. The prices of the latter are increasing at rates higher than the increase in the income levels of people, which is encouraging customers to opt for tiny homes that are less expensive living solutions than constructing a house. This market research report on the global tiny homes market 2018-2022 provides an analysis of the most important trends expected to impact the market outlook during the forecast period. Technavio predicts an emerging trend as a major factor that has the potential to significantly impact the market and contribute to its growth or decline. Retirees and people over the age of 50 accounts for most of the global inhabitants of tiny homes. This share is expected to increase as an increasing number of baby boomers and early X-generation people retire during this decade. This increase in the demand for tiny homes from retirees is leading several tiny park and vacation park operators to convert parks to exclusive retirement home communities. “The tiny home parks for senior citizens are usually well maintained, secure, and provide a quiet and desirable lifestyle for people looking for affordable housing options after retirement. Residence in tiny home parks costs significantly less than staying in retirement in villages, besides providing better facilities than old-age homes,” says a senior analyst at Technavio for research on construction. This market research report segments the global tiny homes market into the following products (mobile tiny homes and stationary tiny homes) and key regions (the Americas, APAC, and EMEA). The mobile tiny homes segment held the largest market share in 2017, accounting for nearly 68% of the market. However, the market share for this application is expected to decrease nearly 2% by 2022. But, this product will dominate the global market throughout the forecast period. The Americas was the leading region for the global tiny homes market in 2017, accounting for a market share of close to 88%. This region is anticipated to project steady growth during the forecast period. 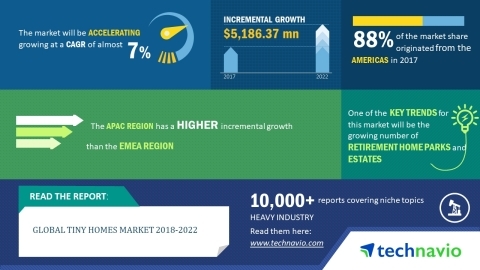 The global tiny homes market is expected to grow at a CAGR of around 7% during 2018-2022, according to the latest market research report by Technavio.